This European-style Parisian Hot Chocolate recipe is so rich, you only need a little. The kids will go crazy for it. 1. In top part of a double boiler, mix milk, chocolate, cocoa, and sugar. Place over simmering water and cook, stirring occasionally with a whisk, until chocolate has melted and mixture is smooth and hot, about 20 minutes. (Don’t have a double boiler? Heat chocolate mixture in a small saucepan over a larger pan of boiling water.) Stir in cream and heat through. 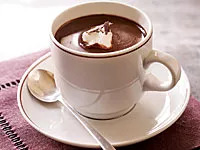 Variation: Make Mocha Chocolate à la Paris by substituting hot, strong-brewed coffee for whipping cream.